Chances are pretty good that you’re familiar with Jules, over at the terrific blog, Go Jules Go. Odds are really good that you’re familiar with me and my blog, what with you reading this sentence and all. Also this one. And this one. I mean, Bronson Pinchot, right? That’s pretty weird. Got to mean something, you’d think. We’re both left-handed. We both live in states where it’s illegal to pump your own gas for no logical reason. We both recently thought about Bronson Pinchot within a few hours of each other. We’re both married to serious foodies. We both write humor blogs. We both like the actress Alison Pill, but for, um, different reasons. We both rarely get sick, yet got this horrible, horrible cold/flu hybrid death plague thing at the same time a few months back. We both have dogs who are in the running for “cutest on Earth.” Perhaps most tellingly? You’ve never seen us in the same place at the same time. No one has. Only their mothers can tell them apart. Are we each other’s doppelgangers? If so, what does that mean? Is there a card for that? Regardless, we’ve become tough to tell apart. In fact, just the other day, someone wrote a comment on one of my posts to Jules, then added a second one saying “Oops! That comment was meant for Byronic Man.” Even in my comments people can’t tell us apart! 1. One of us loves Glee. One of us thinks it’s worse than syphilis. I forget who feels what, though. 2. We both occasionally post things we find on Facebook. If it looks kind of like this? You’ve probably got a Jules. If it’s more like this? Probably me. By Erik Larsen, at Image Comics, San Francisco. 3. Facial hair: Jules’ has a moustache that is fake. I have stubble that is real. You may have to look closely. Here’s a hint: does the facial hair seem to be connected to eyeglasses? Probably Jules. 4. Jules gives away a lot of things, including cool, neon slap-bracelets because she’s nice, and generous, and community-minded. I have given away… well… nothing. Ever. Because I’m part Scottish, so I’m cheap, and also because I can’t think of anything good. The best I’ve been able to come up with for a giveaway is Byronic Man sheets, and then you’d be trying to fold the fitted one, and get all mad and roll it in a ball sputtering, “Stupid #&!! @%**, #%&! * Byronic $#&! **@ Man!” because fitted sheets have that effect on people. 5. Jules loves chipmunks dearly. I, well, chipmunks and I get along fine. I feel affinity for them, rarely call them squirrels, etc. We have nothing but positive things to say about each other. Love? I’m just not ready to go that far. So, Chipmunk love? Jules. Chipmunk cordiality and mutual respect? Byronic. Um… shoot. I can’t think of anything else. There must be something else… Well, if she is my doppelganger, or we’re the bizarro versions of each other, then, hey, that worked out pretty well, I’d say. ← Rage, Rage Against The Dying of the Dark. Nice post Jules, I mean Byronic Man. Who are you again? I’ve started tattooing clues for myself on my body, a la Leonard in Memento, so I’ll get back to you. That can happen a lot, that mistaken identity. I often get mistaken online for Professor Richard Wiseman the psychologist, Aside from our name the only thing we have in common is that he works at The University of Hertfordshire and I did my degree there. I suspect he secretly likes being mixed up with me because I’m better looking and I’m not bald and annoying. I had a hilarious comment on my blog saying ‘You’re Not Richard Wiseman! Who the hell are you?’ and another saying ‘Don’t click this link it’s a trap, it’s not Richard Wiseman; they’re trying to steal your details.’ I thought of responding to defend myself but I thought it would be like trying to convince a stubborn, persistent ageing and muddled relative at a family wedding that I wasn’t, for instance, Terry from the baker’s shop and no I wasn’t delivering their cream cakes – the correct response is to agree, say the cakes are in the kitchen and go home. Never argue with idiots, drunks or teachers, that’s what I say. If I was you when people mix you up with Jules, just go with it, but only as far as responding, don’t start dressing up or anything, like Josh did in that episode of Drake and Josh where Josh wears a dress as his alter ego for his agony aunt column. Is this your subtle way of suggesting that I should stop asking you therapy questions? Well, me, this is clearly your best post yet. I don’t know how you do it, but I assume it has something to do with just the right amount of facial hair. And the fitted sheets! Yes! We, I mean, I should bestow them upon S/He Who Can Fold Them. It would be akin to the sword in the stone, I think. I had already forgotten about that comment where someone called you me (told you, swiss cheese head)! Obviously I have no choice but to assume you’re me. I definitely got the better end of the deal here. P.S. – Tell me that’s not a fitted sheet from when you were actually writing this post (I think I’ve seen that picture before? ), because at about 11pm last night, I spilled Peppermeister’s iced tea ALL over the bed and had to take off the duvet (the fitted sheet’s evil twin) and put it in the wash. It was not my finest moment. No, that’s just some random Internet pic. And I forgot about the caramel! I may have to add that in, because I don’t know anyone else who doesn’t like caramel. I don’t like caramel. Are we triplets? Dana, you might be onto something. 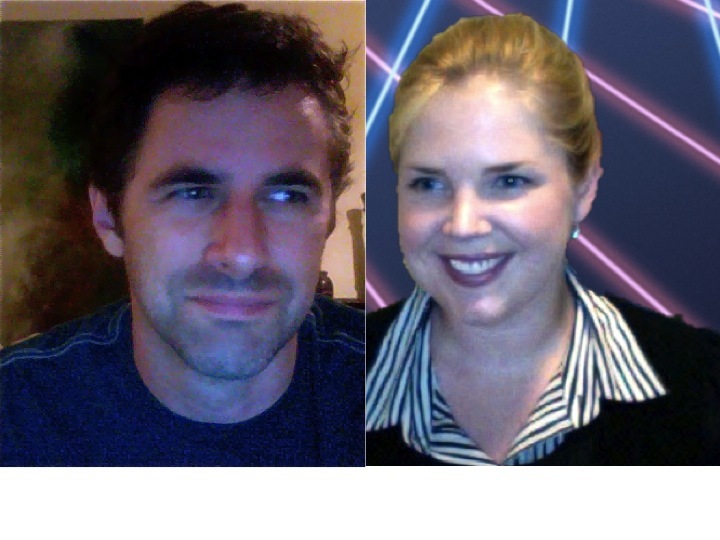 you two make a great comedy team – enjoy both of your blogs equally but differently! Well, excellent. Although what these “differences” are, I don’t know. Excellent. Oh wait…I already said that. you guys.. this makes so much sense. i never twigged that you are actually the same person before, but it all seems so clear now, i feel cheated!! I/We get freshly pressed twice as often this way. Oh, my gosh! I can barely tell the two of you apart! It’s really spooky. Wait. Were you the one in the house shoes or the kid hanging out with the tiger? I’m the one who doesn’t wear side-ponytails. Really?! There are similarities? I’ve got to start taking notes when I read. On the bright side, “more slap braceleted than before” – too funny! Dave. I know. We have nothing in common. I mean, he thinks HE’S the edgy one. Then again. We both hate caramel. So. Hard to say. You haven’t been taking notes??! You’re going to be screwed on the test. You didn’t know about the test?? And why are you in your underwear? Hmmm… so, confusion makes people read… That will come in handy for my upcoming “Purple Monkey Dishwasher” series. Oh boy, could ya hurry up and post that already…! And um, I just have to say…the fact that someone as popular/hilarious as you has just followed my tiny little humble blog is totally awesome. Unless you accidentally clicked the follow button, ’cause I hear that happens sometimes… Oh boy. If so, this comment is totally embarrassing………. How could I not follow a blog written by an adorable puppy, who’s also Puerto Rican? Apparently there are long, long, incredibly detailed videos available online on how to fold them. I used to try and then one day wadded it up and thought, “Well, this is much easier” and never looked back. I can’t be bothered. There are so many other things I could be using my time for. Like opening a web browser, staring at it, wondering why I opened it, writing post dated rent cheques, or even forcing myself to watch daytime televison. There is nothing better than having a great writing relationship. I’m so glad you and your second husband… Wait. I’m so glad that you and your second wife have this cool synergy. I have it with my partner, El Farris. We bounce ideas off each other and talk on the phone way too much. Meanwhile, Byro. 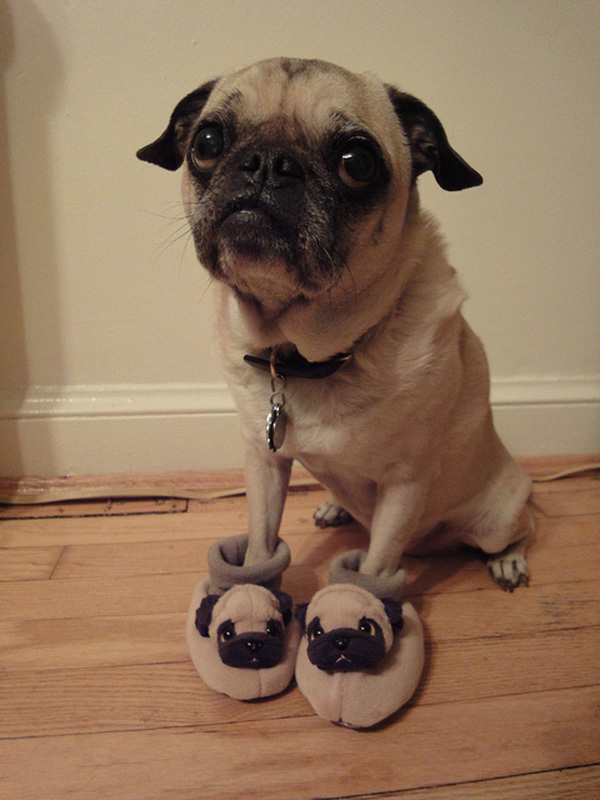 Have we ever seen pictures of your dog? Uncle Jesse is pretty cute. 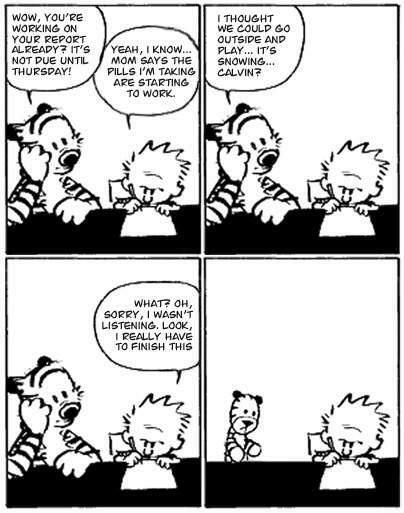 That said, I prefer Calvin & Hobbes to pictures of puppies. But there is a very good reaon for that which Jules can share with you OFFLINE. *wink* Unless she forgot. You should do a giveaway. Julie’s giveaways are the best. Plus, I love to win. You should just give me something right now. My victory is inevitable. In short, I adore you both; you complement each other beautifully. But Julie is easier to tweet. Just sayin’. How are you for sheets? The best writing partner ever. Right there ^ is Renee. Hey, Byronic man– –>this woman<– needs sheets. And hey, summer is harshing my mellow. My children are learning to play the bagpipes and they've been off their ADHD drugs for two days. I might be moving North. Alone. Jules, the only reason to quote from people's earlier comments is because you don't feel like writing a response lol. “Harshing my mellow”, “learning to play the bagpipes”; your grasp of street slang is so impressive to an old lady like me, El. Bravo! But what does the bagpipes thing mean, exactly? Well, darling Peg, the bagpipes story is a long one. Do you have your teacup in hand? Many years ago, when I married Mr. Hell, my mom had one of her whiskey-induced “big ideas.” It involved bagpipes, my upcoming wedding, and a very tiny chapel. Six months later, the minister pronounced us man and wife, and so help me God (giggling) I turned around and damned if there weren’t these braying, yowling, cat-screeching bagpipes rocking out the wee lil’ chapel. My husband held my hand very tight and I did everything in my power not to bring my hands to my ears to drown out the band of Scottish yowlers. Ahem, bagpipers. To this day, when I read the word “kilt” or “bagpipe” I start to howl-giggle-blush, just like I did that hot summer afternoon October 4, 1997, when my mommie dearest won the bagpipe brouhaha. Bagpipes in a small room is a consciousness-battering experience. There’s no volume knob on a bagpipe. Wow. What a great surprise wedding gift for you…er…yeah. Another . . . smirk! Wait, which one of you is Bronson Pinchot? I’m Risky Business Bronson Pinchot, she’s Beverly Hills Cop Bronson Pinchot. Oooohhh, does this mean I have a second son? Another set of twins? Twice the laughter and stubble? I’m so happy! 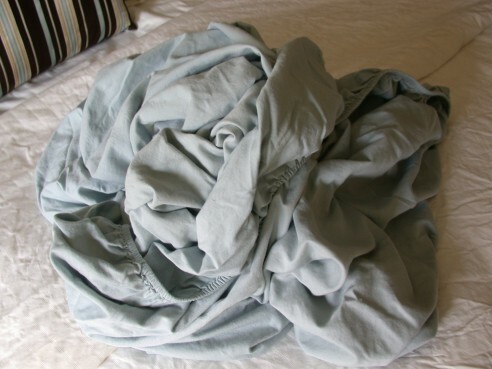 Oh, and I even know the secret to folding fitted sheets. Intriguing, I know. I’d have to see the fitted sheet folding to believe it. Probably twice – once, I’d assume was an anomaly. And thanks for coming by! It’s nice to “meet” you! (you know what I mean). I feel like a foreign dignitary has come over. I should have cleaned. I think Babs is going to print this and hang it on the fridge. You know if I could, I would. Print, that is. Royalty. I LIKE it! Unless by “foreign”, B. just means really weird. Twinsies!! Oh, man. I mean, if Jules were to put on a red dress and B-man were to be wearing a toothpaste costume, complete with white painted face and lampshade hat, I think it would be near impossible to tell who was who. Really, Jules, this was a great post. The similarities are eery!! 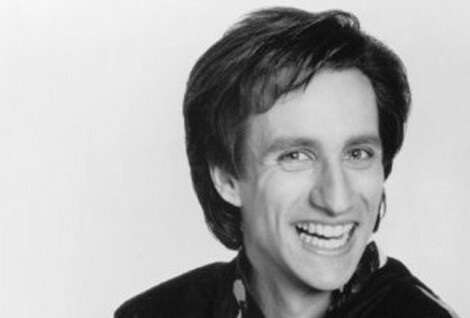 I mean, WHO on earth ever even thinks about Balki any more, and for both of you to think of him at the same time? Yeah, there is some kind of cosmic mindmeld thing happening there. Oh, and don’t you dare send me those mother#$%&ing sheets!! I feel like I need to write in all caps – I can’t take ANY credit for this post and B Man’s awesomeness. Honestly. I feel like maybe I should send him the Crest costume as a thank you. He could sleep in that and never have to deal with fitted sheets again. No one drinks for free at Casa de Jules. Luckily, you’ve already paid the price with that picture. Not sure if we done got anything on tap, though, fancy man. So you’re saying I should lay off the Wal-Mart jokes? can you write more points cos i am still not able to know which one is you…which one of you has 100 cars..and who hates vampires ! Did someone say sparkly vampires? Do they have syphilis? Because that changes everything. I’m glad you guys finally cleared this up. Our long, international nightmare is finally over. Oh B! Do you know Rache? I can’t remember. Well. If not, I’ll be outing her awesomeness on my blog soon. Thank you to both of you for keeping us guessing … and laughing. The real Calvin & Hobbes, or that tribute one here? Or both? And your misdirected comment actually was totally reasonable in context. I post the Calvin & Hobbes strip that is from their web site. The one you posted is very cute – but, also very sad because Hobbes feels ignored and unloved. Thank YOU, Judy, from me. I mean him. I mean the one who just posted Family Circus. Just kidding. Cats in hats. I was onto you guys when I noticed that both of your blogs would show up in my reader at the exact same time. And then to be FP on the same day. I mean, who does that?! I think I’ll have to solve this mystery once and for all and invite you both here to my house for some lobstah and beer. Maybe then you can pull the ol’ Jack-Tripper’s-twin-brother-Austin trick. (ahem) I love your banner! It’s the best banner I’ve ever seen in my life. Please keep it up there all the time. “Jules” and “Byronic Man” are actually fictional creations as part of this massive, long-term PR campaign for a Jekyll & Hyde/Fight Club book I’m writing about two humorists who turn out to be the same person, just alter-egos of each other. Wow, this comment thread is chock full ‘o goodness. I might not have the strength to adequately reply without some lobstah and beer. I think B just called me a humorist. Which makes him a REALLY funny humorist. That’s a brilliant mash up for a book! We should also mash up your names. Maybe we can call you Julronic. Or Byrules. Sorry, guys. You are my new Brangelina and TomKat. Ooh, it’s like we’re a celebrity couple! Just try to remember to sign a prenup. You may have to break up with yourself. I give it two years tops. JuJuBees! I love it (although the actual candy is even worse than caramel). JuJuBees is brilliant, Darla! They always get stuck…in your brain. Wait, Jackie, I just saw this. Byrules! That’s pretty amazing, too. I am so glad that you cleared that up? Hey Jules, uh, Byronic man.Nice post! On behalf of either of us, thanks. It could be a Hallmark movie! Or Lifetime, if we throw in some abuse and philandering. ILLEGAL TO PUMP YOUR OWN GAS? Like illegal, illegal? Like you’ll go to jail? Isn’t that bizarre? It’s illegal, unless you have a motorcycle, then you have to pump your own gas. New Jersey and Oregon are the only two states where that’s the case. The Daily Show did a great story about it years back, interviewing the lobbyist whose job is trying to keep it illegal. Wait wait wait…you CAN’T pump your own gas but motorcyclists HAVE to? I know, isn’t that weird? I’d like to think that there’s different laws for every form of vehicle. If it’s an RV then someone else at the gas station, who’s not an employee, has to fill your tank. If it’s a taxi then the attendant has to pour the gas in a bucket, then you empty the bucket in to the tank. Etc. I really hope this was why you both thought of Bronson Pinchot. Oh, or True Romance would also be acceptable. He’s, seriously, the first thing I think of when I think of True Romance. Here’s a great interview with Pinchot – he only talks briefly about True Romance, but it’s interesting. His thoughts on Risky Business, though? Solid gold. Heh, the Risky Business stuff WAS awesome. Did you see a few days ago, there was a thread on reddit asking which celebrities need to just come out of the closet already and every. single. person said Tom Cruise. I was crying because I couldn’t stop laughing. I feel your pain. I am often mistaken for Cary Grant. But since he died, that only happens when I’m asleep- which scares my wife. Even dead I suspect Grant is more charming and handsome than half the men on Earth. Hey, I have facial hair, too! There’s this one, lone long hair that keeps growing in below my chin – kinda gross. Triplets? Hmmm? I’m thinking of starting up another blog just so I can put Jeezum Crow in the title. Doesn’t it feel so good when you say it, though? Almost like it’s a true swear. Jeezum crow is what all the cool kids are saying these days, for realz. It’s the shizzle. Well, gosh. Now I have another blog I’ve been meaning to get to that I must get to asap and try to catch up on and then not get back to nearly often enough because . . . well, you don’t care about that. Wait, why am I telling *you* this? You know those dreams where you’re trying to pack, but can’t, or trying to pick up the mail (or papers, or something), but there’s too much and it keeps falling out of your hands, and the whole dream is trying to complete the task, but you just never can? That’s how trying to stay caught up on reading & commenting as much as people’s blogs deserve feels, sometimes. You get me. And, hey, I’m just reading on Go Jules Go that I missed your birthday. Happy birthday! I’ll catch you next year. . . Thanks so much, Hippie, for the follow! Maybe I can send you a B-Man Birthday Save the Date magnet? Or B-Man can, for his first giveaway. Or all of the above? I have trouble keeping up. Nice ‘stache! I find your facial hair more attractive, than Jules’, however, I covet her ‘stache glasses. I must find an equally quirky accessory of my own. Great post. Now I have to go read Jules. Wilma, I hope you haven’t entered the Go Byronic/Jules Go zone where you just bounce back and forth and can’t escape, because my post just sends you back here. Personally, I’d much rather be here, because otherwise I have to try to pick a winner for the July ‘stache glasses contest! Wait! There’s a ‘stache glasses contest? I admit I’m new to your blog, but how do I get in on this? Oh poop, Wilma. I could’ve sworn you entered. Unfortunately, it’s past the deadline, but I’m doing another one next month (around this time of the month, and there will be about a week to enter)! Duly noted. I will stay tuned. I’m thinking I may need my own look though, maybe a bedazzled eye patch or something incorporating a unibrow. I’m glad for this handy guide to telling the two of you apart, and also for the fact that there are the two of you. Like the old gum, this means double the pleasure, double the fun. But not in, y’know, dirty ways. P.S. Jules, that link-up photo of you is fab! Deb. Wait. Does that mean birthday cards with an adult man in a dress sitting on an 11-year-old’s lap are out? Thanks! I think I look better when not sandwiched between Bronson-B Man splendor. Who can live up to that? Adult man sitting on 11-year-old girl’s lap = humorous. 11-year-old girl sitting on adult man’s lap = not so humorous. If there were any way, if Jules and I lived within 300 miles of each other, making a fake Doublemint commercial would be awesome. A lot of work for basically an inside joke, but totally worth it. Crud. Why did you have to say that?! It’s bad enough without knowing the commercial possibilities! And you know HOW to make a commercial, so much like this post, I wouldn’t even have to do anything but smile and nod. No way!!!!! Is that really B man? That photo is classic! If you’re asking about the photo I linked to in this comment thread… Oh, me, please, stop me from running with this for all it’s worth. Okay, since I’m also B-Man, I wouldn’t do that to myself. I was wondering how you’d handle that. The temptation there… oh, the temptation. Because then the more I denied it was me, the guiltier I’d look. 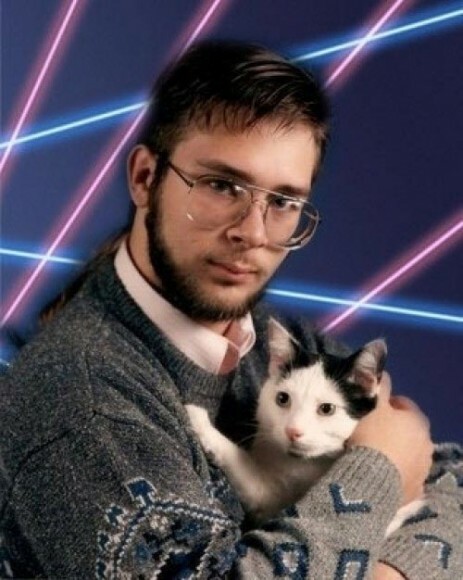 I wondered where the laser backdrop came from! I thought it was maybe in the Photobooth program, as part of there “Weird backdrops” feature, but couldn’t find it. I’m going “Whole face” more and more these days. Phase 3 is “torso” (clothed). The last I heard from Jules was when I told her I wanted to tongue-kiss her for a compliment she paid — and I’m not lesbian. I think that I scared her off. Can I offer *you* a tongue-kiss? I’m just playing fair. No way! Don’t try to make me jealous, L! Although I have been SHAMEFULLY behind, I know. I wouldn’t blame you if you took your affections elsewhere…although if we’re the same person, I guess this all works out. Sure, sounds good. If you see someone, and you think it might be me, tongue-kiss first, ask questions later. Best policy, really. You can always apologize. I have mixed up Byronic Man with Good Greatsby! I think it happened because I was thanking Good Greatsby for winning his caption contest (and I compete in Byronic Man’s caption contests) when my email notification popped up with your (Good Greatstby.. I mean Byronic Man’s) name on it. I can see where people would mix Jules and Good Greatsby up! Uh-oh. Now Greatsby thinks I stole his caption contest idea. I didn’t! I swear! I stole the New Yorker’s caption contest idea! Actually I just wanted to mix up the Question of the Week. I thought about giving a caption and people look for the best image, but thought that might be too labor intensive. I believe you and have entered in that caption contest too! That would be a lot of work for some. Jules’ mustache is fake? It’s like finding out that Santa Clause isn’t real! Umm, where do you stand on booze, Byronic man? Cause if you’re not a lush, then it will be super easy to tell you two apart. Rian, that is an excellent point. I think. I’m still drunk from last night. Until I see you BOTH in a dress (maybe the same dress – not at the same time, though) Then I’ll believe you are twins. I’m up for the lobstah and beer. I’m always up for lobstah & beer. I think Darla’s comment qualifies as offering to host a party. C’mon ovah!! par-tee! par-tee! par-teeeee! I think so. He’s the old one. Heh. Why, you insolent whipper-snapper! In my day we didn’t talk about bloggers that way! And we wrote our blogs by hand, with quill pens! You two are a regular Rowan and Martin. (You can Goggle it if you weren’t watching late night television in the early ’70’s). You bet your sweet bippy I know Rowan And Martin. I’m well versed in chipmunks and slap bracelets, but am new to all things byronic. Thanks B, errr Jules, errr B, for providing the secret decorder ring to keep you two straight. Jessica, I hope you have time for another blog because B Man is like chipmunks and slap bracelets on crack, but, um, manlier? I feel oddly fulfilled whenever I find out I’ve sent people here. Well. I always thought I’d be an awesome greeter, like at The Gap. Maybe I can live that out here. Thanks for coming! Did you know if you read one post, he gives you the second one for free? With a deal like that, who could say no? I’m so glad I’m not the only one who has noticed your sameness! And the fact that I’ve never seen either of you in the same room with Bronson Pinchot is also mysterious. The only way we can clear this up now is if you were to both perform The Dance of Joy while wearing matching embroidered cummerbunds. Something to think about for your next collaboration post. Ang, this is another wonderfully nostalgic and hilarious comment (and I’d expect no less), but all I can focus on is the spelling of cummerbunds, which I just recently learned. I can’t say that word without feeling like maybe I just had a stroke because how can that be right? I love anyone who loves Jules. Nina! That’s funny. Because I love anyone who loves me, I mean, Byronic Man, I mean… er. I think this is all going to work out somehow. I’ve never seen your whole face! Glad to know my Ouija board premonitions of a terrible childhood accident are completely untrue.